New York City is full of unexpected surprises and it is always a pleasure when the surprises turn out to be delights. Few know about the splendid 1607 library which keeps a low profile on the Upper East Side, quietly built into the stately edifice of the House of the Redeemer. Constructed to house the library when it was brought back from Urbania, Italy by the early 20th-century philanthropist Edith Fabbri in order to save it from the destruction that claimed its original containment, a della Rovere Palace, the House of the Redeemer is a dead ringer for a Florentine palazzo of sober Brunelleschian splendor. To enter this astonishing piece of history on a dark and rainy night would be cause for wonder enough, particularly if you’ve never seen it before, but to also be treated there to a first-rate concert by a young Italian ensemble of Italian music from the same era as the library itself is cause for celebration of and gratitude for not only the artists, but the entity that makes it all possible. This is the sort of coup in which Salon/Sanctuary Concerts excels – beautiful, intimate evenings of early music in spaces such as this, spaces you may never have known were right next door, and which are so perfect for the music that you are left wondering how you could ever hear this repertoire anywhere else. Under the direction of intrepid Artistic Director and soprano Jessica Gould, the series seems to go from strength to strength, and it is always a pleasure to let go of your preconceptions and see where Gould will lead you next with her venue choices and inventive programming. Giulio il Romano: A Concert for Caccini was the program presented this stormy evening amidst the dark wood, satin damask, marble fireplace, charmingly threadbare tapestries and authentic coats of arms, performed by the gifted Italian group Ricercare Antico and the strikingly talented young tenor Riccardo Pisani, who, like the composer of the evening, is a native of Rome. 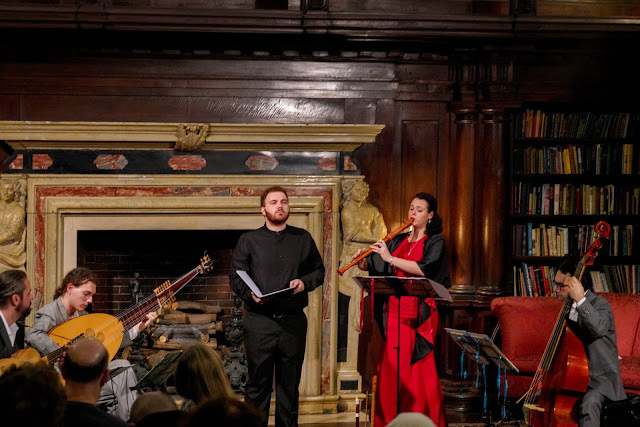 Not an original program of Gould this time, but of the ensemble, the New York performance marked a final stop in a tour that took the group across Italy, Mexico, and elsewhere in celebration of the Caccini year. We are in the closing weeks of the 400th anniversary year of the death of Giulio Caccini, who moved to Florence from Rome and became a founding member of the Florentine Camerata, the group of luminaries who brought forth opera as we almost know it, the composer devoting two volumes, Le Nuove Musiche, to arie and canzone preceded by lengthy introductions on the art and technique of singing. These songs are often used as pedagogical pieces and recital warmups in our country, but they are actually quite challenging in every way, and it was a rare treat to hear them performed so masterfully with the loving attention they deserve. Also on the program were works of Caccini contemporaries Frescobaldi and Nicoletti. Many of this year’s tributes have been to the composer himself, many to his gifted daughter Francesca, who wrote the first opera (as far as we know) by a woman. The results have been mixed, and as a listener and devotee of this period of music, until this evening I have often found myself feeling less than satisfied by the vocalism on display. I had the pleasure of hearing Pisani earlier this season in Florence in the Maggio Musicale Festival, where he was one of the rewarding takeaways from a poorly conceived production and uneven cast. Hearing him in a full recital evening only proved why. Pisani’s baritonal tenor is refreshingly full, resounding, and well supported, with an easy command of rapid-fire coloratura that sometimes eludes larger voices. His flawless diction (I am speaking here as a non-Italian, mind you), is not merely one element of a technical checklist that he has mastered through study, but an actor’s tool that he wields deftly in order to extract maximum meaning from every word and create a dramatic world for each song. An impressively sustained messa di voce towards the end of the program was icing on the cake, a clever touch in the song "Odi Euterpe" (Hear, Euterpe), whose text implores the Muse of Music to listen in. I have seen less aware singers perform this repertoire in a nondescript wash of restrained affect and monochromatic color, as if the very act of feeling and communicating anything would break some kind of precious glass vitrine. The reward of hearing and watching a singer like Riccardo Pisani is to feel that you understand the words yourself because of the color and contrast he deploys in the service of the text, and that you are being led into a new and gripping story with every song. I find his way of singing a refreshing rebuke to the English choirboy orthodoxy that has seemingly held a chokehold on baroque singing until very recently. At 29, he is clearly a singer to watch and his colleagues were no less engaging. Ensemble Ricercare Antico, a small group of Florentine and Roman virtuosi, offered elegant and stylish support. Punctuating the tenor’s inflections was resonant and intentioned bass from Francesco Tomasi’s and Giovanni Bellini’s theorbo and archlute, while Serena Bellini’s recorder obbligato was a deft and charming complement is a few lighter pieces. A baroque guitar, played fleetly by Tomasi, added a more percussive color contrast, and the tight ensemble, which includes Matteo Coticoni on violone, did as much painting as the soloist, responding spontaneously with his every shift of expression. A glimpse every now and then of the faces of the players showed them to be as dramatically tuned in as the singer. This delightful meeting of effortless sprezzatura and dramatic chiaroscuro should hold as a model for every ensemble engaged in the task of basso continuo support, as I hope more singers in this area of specialty will take Pisani’s lead in trusting the power and truth of what a fully expressive voice can say. If they were listening on Friday night, I have a feeling that both Euterpe and Caccini would be proud.